Slovenly from Revival in 87. 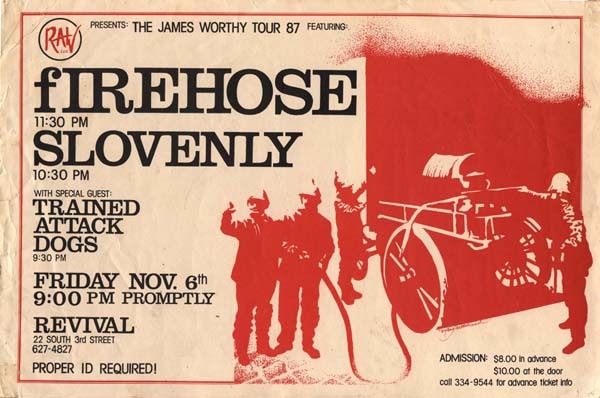 They opened for Firehoose on the James Worthy Tour. They did allot of songs off the Riposte album which had yet to be released (I think) and then a few from Thinking of Empire and After the Original Style. One of the SST bands of the late 80’s that never really got the popularity I thought they deserved. They had a truly unique sound which it seemed like people loved or hated. If you want more info on Slovenly read this. I don’t think they played in Philly again after this at least I don’t remember seeing them again and I would have gone. Currently their guitar player Tom Watson was touring with Mike Watt. After Slovenly broke up some of the members released a couple of albums as Overpass. I’m not sure what anyone else from the band is currently up to.